I left work late, around 7.30pm and decided that I wanted to test both my fitness (my back seems greatly improved now) and my new toy – L&M ARC NiMH HID light 🙂 Here are some observations related to my cycle trip home this evening. Dublin is windy. Dublin , along the coast, in late November, at night, going downhill into a headwind, is very feckin’ windy! My Gortex jacket and Cannondale gloves are definitely windproof, thankfully! I think I need to work on my layered system though – football jersey and jacket do not a wicking system make! My new Light and Motion ARC HID is so bright it’s unbelievable. I had a guy stop his car, reverse back to me and ask about it. His wife/gf was leaning across him to tell me she thought it was brilliant too. I asked if it was too bright but they said no, just perfect. Roadies are good. I stopped along the coast on my way back for 2 mins to take a look at my surroundings (quite often I forget to do this!). When I was stopped I saw a blinkie coming toward me on the cyclepath, so I waved to the light. Turned out to be a roadie out on a training run, in full winter skin tights. He checked if I had any mechanicals, said good luck and continued on his way. If you’re interested, here’s my route. I turned it from a 4.4km commute to a ~25km trip (+/-5km error – no computer on yet). 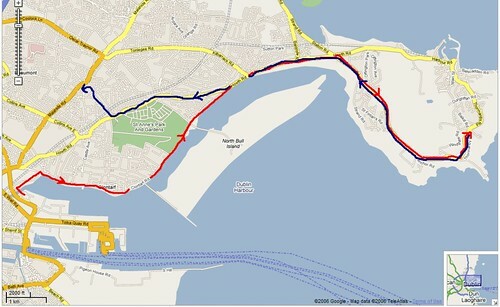 Red is from work to the top of Howth Head, blue is return home. Update: it’s actually 27.5km according to Gmaps Pedometer – thanks for the link Damien. Just discovered your website. Nice Work. Where did you purchase the L&M ARC HID and how much? 27.5km according to Gmaps Pedometer. Fair play. On a dark evening too! Owen, welcome & cheers for the compliment. I got the Arc from BeyondBikes.com in San Diego. I got the NiMH battery because it was far cheaper than the Li-ion. Check back, I will be posting up a full review (with photos) of the Arc in a couple of days time. (Stick an email address in the box above and you’ll get it in your mail without having to remember to visit). Damien – that site is really cool, cheers! Cycle Superstore in Tallaght stock Light and Motion lights.